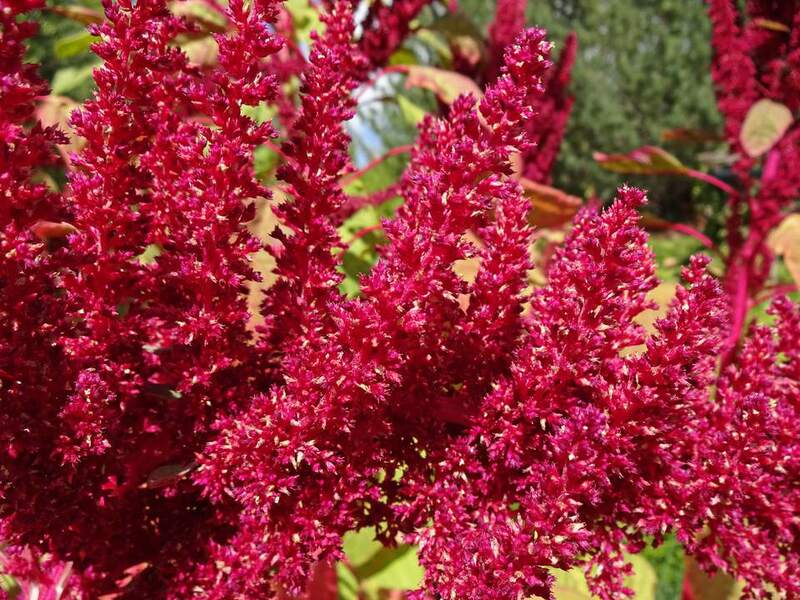 For a while, Love Lies Bleeding amaranth was grown strictly as an ornamental plant. That gives you an idea of its visual interest. From broad foliage to stunning colors and gorgeous when it goes to seed, amaranth can add to any beautiful landscape layout, but what if you want to grow edible amaranth? Here are our tips for growing own organic amaranth crop right in the front yard. Amaranth used to be a staple in cottage kitchen gardens, which is probably why it stuck around as an ornamental when we collectively moved away from edible gardens in every home. If you’ve purchased amaranth before, it was likely as a grain. The seeds hang in tassels with tons of little bitty seeds used as a grain. When you grow it, though, amaranth can also be used as a leafy vegetable. The leaves are similar to spinach leaves when harvested. Varieties can range from giants topping 8-ft tall to smaller 1 to 2 ft plants better for their leaf harvest alone. You’ll want to cultivate larger plants specifically grown for their seeds if you want the amaranth grain. It’s very fine and small, so you don’t want to try to get a whole crop of grain off of smaller plants. Greens, on the other hand, can be harvested as whole plants, so you would want plenty of the smaller varieties. You can harvest both leaves and grain from any edible amaranth, though, so you can also choose a variety based on what your edible garden needs for height and color. Amaranth can have a wide range of foliage colors, from the rich green foliage of Mercado to the deep scarlet red of Molten Fire, to the blended colors in Joseph’s Coat. The flower and seed tassels can vary, as well – try Juana’s Orange, Elena’s Rojo, and Love Lies Bleeding Green. Unlike other leafy green vegetables, amaranth is fairly happy in the heat. In fact, it is native to the southern US and Mexico, so you have a lot of leeway for a warm spring and even summer! It’s also pretty drought tolerant, though it will do better with some moist, well-drained soil. For best results, especially if you want to stagger plantings, start amaranth indoors first. If you sow seeds directly outdoors, wait until a week or two after the last frost to allow the soil to warm up. Same with transplanting – these are warm weather plants and frost won’t do you any favors. While amaranth is tall, they aren’t necessarily wide or bushy. So you can get away with growing them 10-18” apart. The closer you can get them, the better they look once full grown. The best part about amaranth in a busy garden is that it’s a plant family all its own. Rotate it around to those frustrating places where you have planted just about everything in the last couple of years. You’ll get a fresh look and the soil will get a break. As far as growing amaranth goes – that’s about all you need to know! They are incredibly easygoing plants and still provide an amazing return in the form of stunning colors and unique flowering structures. Regardless of your cultivar, amaranth leaves can be harvested at any point. Small leaves are tender and nicer, but the larger leaves have a full flavor as well. Large growth and heat won’t make amaranth bitter like other leafy greens. Trim leaves off to harvest, and leave the crown and some leaves around the top to continue growing. If you’d like, you can cut the whole plant down once it is a foot or so tall. It’s possible that it will reshoot for another harvest, though you do risk introducing pests to the open stem. To harvest grains, let amaranth go all the way to flower. You want that for your edible landscape anyway. Keep an eye on them as the flowers bloom and then begin to die back. Before they all brown, cut them off and bag them. In the bags, they’ll dry. Shake the bag once they are dry, or knock the seeds loose over a cloth. Rinse away the dried seed “chaff” and enjoy your grain harvest! Amaranth grains are especially good in a porridge of other grains like millet and quinoa.